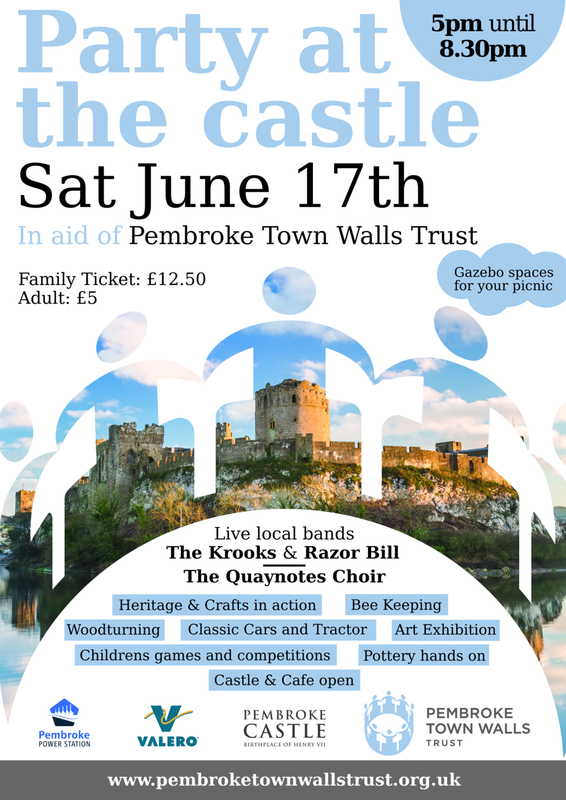 Join us in Pembroke Castle on Saturday the 17th of June for an evening of music, games and heritage. This is our 3rd year running this great family event which has, so far, raised over £2000 for the Town Walls. This year we have an exciting mix of live music including The Krooks, Razor Bill and the Quaynotes Choir. The Party at the Castle is a fun event for the whole familly; come and enjoy a mix of children's games, heritage and crafts. Attractions will include hands on pottery, wood turning, bee keeping, classic cars and art exhibition. The Castle will be open to explore throughout the evening. Food and drinks will be available from the Castle Cafe or alternatively feel free to bring along your own picnic. Tickets are available on the door. Adult tickets are £5 and familly tickets are £12.50. The Pembroke Town Walls Trust is being supported by the Co-op Local Community Fund. Please help us by signing up to the Co-op blue card scheme so that Co-op will donate 1% of your purchases to local causes. The money raised is split between local charities and community groups. You can further help the Town Walls by going to our Co-op community page and registering your support for our cause allowing us to receive a greater share of the money raised.